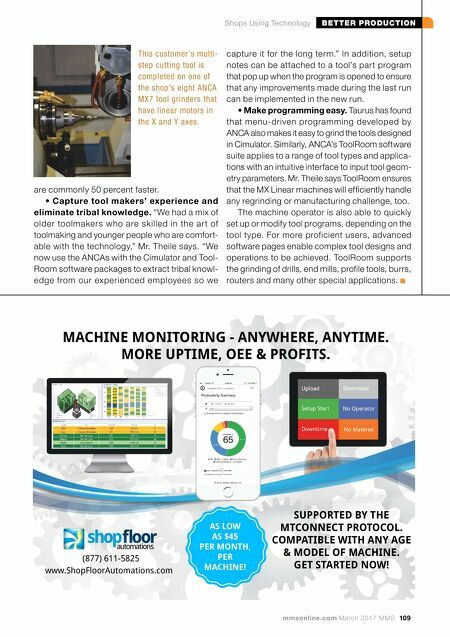 BETTER PRODUCTION Shops Using Technology mmsonline.com March 2017 MMS 109 are commonly 50 percent faster. • Capture tool makers' experience and eliminate tribal knowledge. "We had a mix of older toolmakers who are skilled in the ar t of toolmaking and younger people who are comfort- able with the technology," Mr. Theile says. 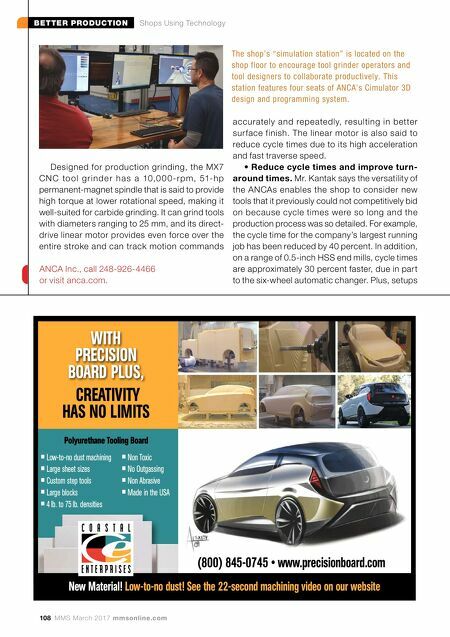 "We now use the ANCAs with the Cimulator and Tool- Room software packages to extract tribal knowl- edge from our experienced employees so we This customer's multi- step cutting tool is completed on one of the shop's eight ANCA MX7 tool grinders that have linear motors in the X and Y axes. capture it for the long term." In addition, setup notes can be attached to a tool's part program that pop up when the program is opened to ensure that any improvements made during the last run can be implemented in the new run. • Make programming easy. Taurus has found that menu-driven programming developed by ANCA also makes it easy to grind the tools designed in Cimulator. Similarly, ANCA's ToolRoom software suite applies to a range of tool types and applica- tions with an intuitive interface to input tool geom- etry parameters. Mr. Theile says ToolRoom ensures that the MX Linear machines will efficiently handle any regrinding or manufacturing challenge, too. The machine operator is also able to quickly set up or modify tool programs, depending on the tool type. For more proficient users, advanced software pages enable complex tool designs and operations to be achieved. ToolRoom supports the grinding of drills, end mills, profile tools, burrs, routers and many other special applications. www.ShopFloorAutomations.com (877) 611-5825 AS LOW AS $45 PER MONTH, PER MACHINE! SUPPORTED BY THE MTCONNECT PROTOCOL. COMPATIBLE WITH ANY AGE & MODEL OF MACHINE. GET STARTED NOW! MACHINE MONITORING - ANYWHERE, ANYTIME. MORE UPTIME, OEE & PROFITS.